For retailers, the post-holiday return rush can be almost as overwhelming as the initial sales action. So, it may be difficult for you to use the words “happy” and “returns” in the same sentence. But, rejoice! With a new outlook on customer returns and a new approach in place, you and your customers will indeed be happy. Returns are inevitable. Yes, some people are simply hard to please, but holiday sales are about gift-giving. No surprise, then, that the gifted item is the wrong size, color, style or — seriously, Aunt Marge? — wrong in every way. But returns don’t have to be a pain, for customers or for your store. You can transform returns from a dreaded negative into an experience so positive it generates new sales and brand advocates. Here are a few tips to manage customer returns. You’ve undoubtedly returned something in the past. How did that go? Uh huh, that’s what we thought. Wouldn’t you rather have seen a friendly smile and a fast, flexible process? Well, that’s what your customers want, too. So let’s give it to them! There is no point in making a bad situation worse with petty, rigid rules. Nordstrom, a pioneer in the easy returns department, can tell you that goodwill begets goodwill — a good experience indelibly distinguishes your brand from the competition. It brings customers back, whereas a bad return experience can send even a formerly-loyal customer packing for good. What thrills customers? You could make your customer returns policies nicer, simplify the process, and call it good. (And it will be.) But, wait! You don’t want to be so hasty that customers miss a chance to buy something else. They’re standing in your store disappointed they have to give back a purchase or a gift. You want them to leave happy. Be proactive by helping them find a replacement item that is the right size, color, or style. And be sure to point out just-arrived merchandise they wouldn’t have seen before. If this is their first time in your store or on your website because their return was a gift, now is your big chance to make an impression that rates your brand as a must-shop in the future. Online retailers can do the same kind of thing to boost sales. When acknowledging receipt of the customer’s return, offer them a discount on anything else they would like to purchase right now. Customers who want or need to return an item often approach that with fear and trepidation. Will you punish them by making it difficult and uncomfortable? Or will you see their return as an opportunity to wow them with a quick assist, followed by helpful suggestions so they don’t leave your store or website empty-handed? Online return forms usually ask customers to indicate the reason(s) they are sending merchandise back. Brick and mortar retailers need this information, too. Understanding the why behind returns will help you make better buying, marketing, and merchandising decisions in the future. And that will reduce future returns. 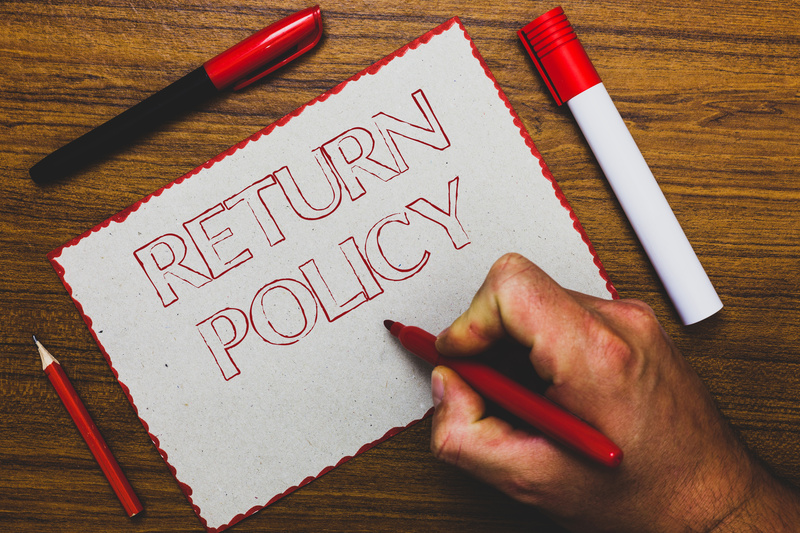 So, take some time to evaluate your returns policies and processes to ensure you're making it quick and easy for customers to make returns and buy replacement items. Not only will your customers be happier, but they'll return to your store and buy more if they have a good experience.